What the heck?? This is so awesome! Never played the games, but this is quite a nice and shocking series revival for its fans. Now where's my Lunar 3 kickstarter?? I'm not surprised to see this going so well. The following is enormous though I feel it's overrated. I never played the 2nd one but I anxiously awaited the first. I finally got it and the game treated the player like a tard and it felt incredibly linear. They built it up like it would be open. The mini-games and the QTEs were fun, though since those were a new thing at that point. With all these megatons being threw out why not go ahead and throw Lunar 3 out there as well! 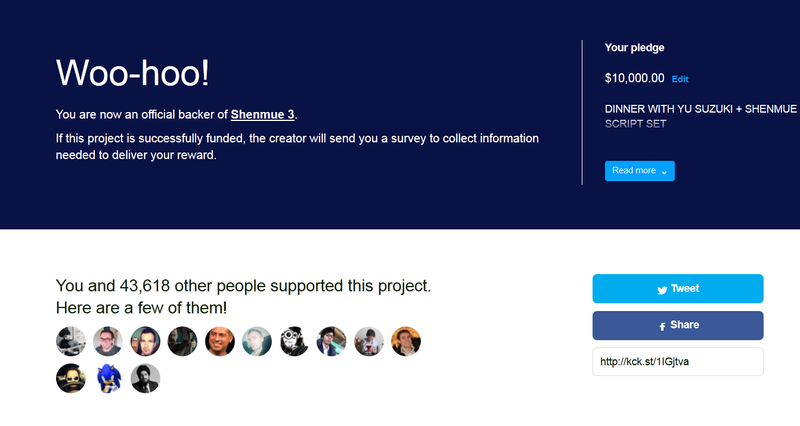 Anyways as a big Shenmue fan I was so happy to see this and pledged on Kickstarter with no second thoughts! Hate to say it, but I'm not sure Lunar has the fanbase for a third one to come out. Ardent Fox wrote: Hate to say it, but I'm not sure Lunar has the fanbase for a third one to come out. And even if it does, it would probably take entirely too much money to get everyone involved in the others in the same room. Aren't a couple of the people dead as well? Then there's the issues of who has the rights to what. Then there's the "Where the hell would they go with it?" aspect. Perhaps Lunar is finished and all of these hurdles are positive things that are preventing ruination? (excepting that DS game that never happened.) It's a bummer to say, but maybe Lunar 3 SHOULDN'T happen..
Not everyone involved in the originals is needed. I'm gonna have to quote an old post from myself. Do you know Eiji Aonuma? He started working on the Zelda series with Ocarina of Time. Look at the success the man brought to a series that was already well established. Look at the voice actors for Super Smash Bros. They are all different for each game, yet the last one, who is much younger than the previous guys, has the best voice of them all. Do you know who Koji Igarashi is? He started working on Castlevania mainly with Symphony of the Night, and he practically changed the series from good to epic. Yet I'm gonna add something new. Has anyone here played Shining Force 1 and 2? Those games have some really awesome soundtracks! YET they aren't even composed by the same person! Motoi Sakuraba totally destroyed Shining Force for me in the Saturn with his music, but people loved that game even more. Shining Force 3 is practically an entirely different team than the first 2 games, except the writer. If a person understands what they're doing, they could mimic what makes a Lunar game. Castlevania and Metroidvania are quite different from one another, though. It's hard to compare them very much. I haven't played much of any Shining Force game because I'm bad at tactics style RPGs. From what I've seen, mimics can turn out fun and enjoyable but the soul is missing. That seems to be a common view of Pier Solar actually... I still wanna play it and see for myself, though. This is why I'm glad Koji Igarashi's next game is Bloodstained and will have to have a different story. Yes, it'll be metroidvania greatness but it should avoid the fate of most mimics by having its own original story that seems to have more potential than Castlevania's. Leo wrote: Castlevania and Metroidvania are quite different from one another, though. It's hard to compare them very much. If you compare Super Castlevania IV with SotN, and put CV4 where Lunar 1 is, then put Symphony of the Night where Lunar 3 should be. It doesn't HAVE to be the same. You don't need to have a girl disguised as Althena without knowing it herself. You don't need a boat scene to be Lunar. It can be something completely different, like Lunar 2 was to Lunar 1. The gameplay could very well be expanded, like SotN did. Think about all this without a budget limitation of course. Look what MegaMan Legends did, it's a completely different style of everything, yet the fans and the creators themselves hold it very dear in their heart, more than most of the original games. "That seems to be a common view of Pier Solar actually"
This is sad. But the truth is the truth. If Pier Solar didn't recapture the magic of Lunar, that's just because they either didn't intend it to be, or if it was the intention, they didn't do the right formula. I haven't played the game to talk except the first minutes. It's a good game on its own it seems, but the character art style is obviously not based on Lunar at all. Hearing Shenmue 3 announced was the happiest gaming moment of my life.. (not an exaggeration). Just when I thought I was done with gaming, my favorite franchise next to Lunar and Monkey Island pulls this. I never finished Shenmue but sold it before finishing. Is there any good way to play it now. Werefrog wrote: I never finished Shenmue but sold it before finishing. Is there any good way to play it now. Outside of finding it in a specialty store or online, you can try to get an emulator from somewhere with the roms and play them via your PC. WD RPG WD wrote: Hearing Shenmue 3 announced was the happiest gaming moment of my life.. (not an exaggeration). Just when I thought I was done with gaming, my favorite franchise next to Lunar and Monkey Island pulls this. Someday when I have time I want to play the first Shenmue again. I only played it once, but it remains a very memorable game. I know this may not sound like a selling point, but I think it's one of the few games to get the mundane or the everyday right. I'm glad you remember that, Kiz. I put up $500 for the Kickstarter. There were 3 $10,000 rewards that were taken instantly. The reward was dinner with Yu Suzuki. Not sure if I would have paid that much if I had the chance but it would have been tempting..
We are up to $3.5 Mil. and 43k backers. Bloodstained got to $5.5 Mil. and 65k backers. Shenmue now holds the record for quickest to $1,000,000. I don't think it has the fan base as the creator of Castlevania to pass Bloodstained for highest grossing ever but it will get close. I wouldn't be surprised to see it surpass Bloodstained. One of the 10k backers just dropped out! Guess what I did! What the hell do you DO? How can you afford to give 10k to anything? Also, will it be you, Yu (lol) and a translator or do you speak Japanese? Who said I could afford it? I speak enough Japanese. It's a once and a lifetime event. It also brings exposure to my(our) school In China where we teach poor kids English at a location from the game; Guilin. It's good to know you speak Japanese. I'd imagine it would be incredibly awkward otherwise. If I had throwaway money, I'd go for that jacket. They should start making those and putting them in a 2-3k donation tier. Yu Suzuki needs to study the Bloodstained KS and do it just the way they did it. There should be more swag and there should be those minor social media goals since they do a great job for advertising. Congrats WD. I saw the $10,000 level and wondered who would be a big enough fan to go for it. Also, it's nice to see that Sonic the Hedgehog supports the project. I haven't donated yet. I like to wait a bit and see how I feel about it.